Camp NaNoWriMo, Title Reveal & Instagram! 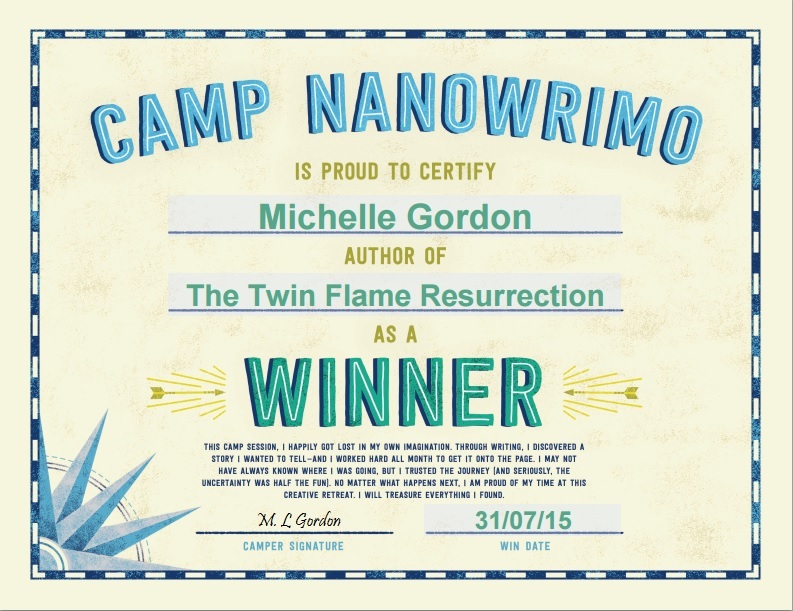 On the 31st July 2015, I hit 50k words, and won Camp NaNoWriMo! It’s been a very busy month of travelling and working, so I was very pleased to hit my target, despite being so far behind on my wordcount earlier that week. The story wasn’t quite finished at that point, so I continued writing and I finished it at the 54k word mark just yesterday. As a winner of Camp NaNo, I received my certificate, and by posting it here, I am revealing the title of the new book, which came to me during a mediation on the last day of Camp. I had hoped to stay away from using yet another word beginning with ‘re’ for the title, but this word is perfect to describe the theme of this book. As usual, when I began writing it, I had no idea what was going to happen, so the original title I chose just didn’t quite fit when I finished writing. The editing will begin soon, and I will publish it by October, though if possible, I will publish it sooner. I also want to start writing my next book, I have so many books flying around in my head, impatiently waiting for me to write them! Will be blogging more often now that I’m not writing too. Look out for my next blog on a Sacred Journey I am taking part in!